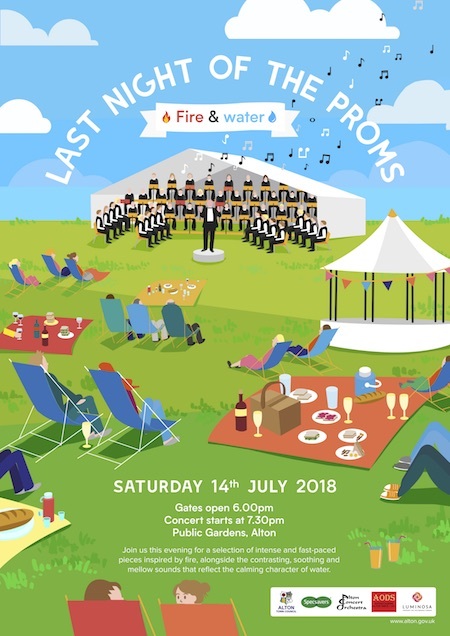 Now in its 13th year, Last Night of the Proms, Alton’s prestigious annual open-air concert will take place in the Public Gardens on Saturday 13th July with gates opening at 6.00pm for 7.30pm start. Alton's Last Night of the Proms is organised by Alton Concert Orchestra and Alton Town Council. LNOTP is a free event and we rely on our sponsors and supports to continue to offer this wonderful concert to the community, if you think you might be able to help support the event by becoming a 'Proms Patron' or supporter please contact us on events@alton.gov.uk or 01420 83986. Details on previous Proms can be found here.